While Hudson was first settled around 1872, the community's namesake Isaac Washington Hudson Sr.'s family did not permanently move here until 1878. By 1884, the new town of Hudson had been platted, and the community's first post office and school were built. In its infancy, the community grew fast and residents relied upon the lands and Gulf waters for their livelihood. With the fast-growing community came the establishment of numerous sponging and fishing businesses in addition to farms. The banks of the big Hudson Spring were becoming the center of commerce, and there the resident businessmen constructed their docks, fish houses, mercantile stores, hotels, and more. Today, with a development on every corner and vacant lands becoming extinct, it is extremely hard to imagine those times. Little of this past remains, and in its place the bulldozers are paving Hudson with progress. Local historian Jeff Cannon traces his Florida heritage to the 1840s and is a fifth-generation Hudson resident. 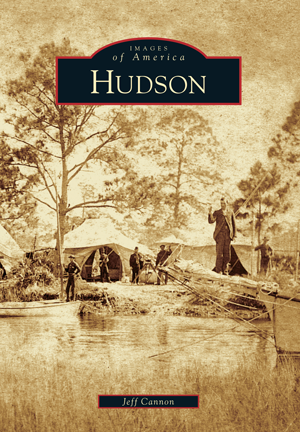 In Images of America: Hudson, he presents the places, faces, and events that have shaped the community's history and character. As the Old South ambiance of Hudson has passed with development, so has much of its history, which is demonstrated in this keepsake volume.